As most pop culture phenomenons, if you haven’t heard or watched “Mad Men” at least once, you are living in a cable-free cave. I could launch into an ecstatic rant about the nuances and complexities of the storylines, the utter amazement at the set details of the time, how handsome Jon Hamm is, but I won’t go there. I want to discuss the ads during the show – one of the bests TV commercial strategies I’ve seen in a long time — which both embraces and ramrods right over the growing trend to skip over ads on your DVR-no mean feat. When Mad Men began its first season, it had “wraparound commercials”, which was a small taste of things to come. Wraparounds are nothing new but are used in a clever way here. 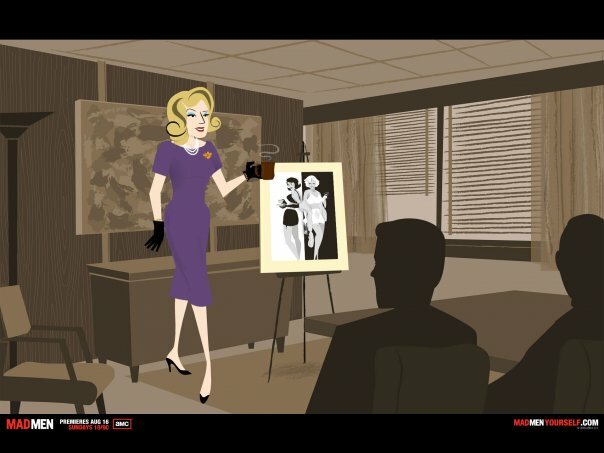 In this case they feature Mad Men’s thematic elements as background and in the foreground a factoid or question about an advertiser, say BMW, and lead directly in or out of the show break. In other words, the line is blurred between when the commercials end and where Mad Men picks up, so you make sure you tune in, sooner rather than later. And you might even learn something interesting (just found out “hotel” came from “host” in French). BMW in particular, and more recently Bridgestone both have advertised his way season after season. As Mad Men grew in popularity, more advertisers got on board with this triple threat: Not only did they have their product commercial during the breaks, their company names were woven into the wraparound commercial, and surrounded a show about advertising. Nice. There are several reasons an advertiser would adopt this ad strategy, the most obvious being to reinforce their advertising message, but another strong driver that has pushed things to the next level is that many viewers don’t watch a show when it originally airs and instead TIVO, DVR or On Demand it, skipping right past the commercials when they view it. This has becoming a daunting, growing barrier for advertisers trying to get mind share, only to see their viewership go down the drain double time. But wait…what if people thought the show was actually starting but it turns out to be a commercial…what a great psych! Unilever, maker of over 400 consumer products, has not only accepted this fast-forwarding trend, it has taken it one step further by creating advertising campaigns for six of their products in the spirit of Mad Men show, amping up the fuzzy line between commercials and where Mad Men starts. This was a great move by the company to tap into Mad Men’s popularity while getting many a remote to stop squarely on their entertaining ads. Each commercial features one of their products, such as Dove, Klondike bars, or Vaseline and star two retro ad men that distinctly remind us of the account guys that might have offices at Sterling Cooper Draper Pryce, but a little more campy. And even though they are not drinking, we get that Mad Men vibe with the set and dialogue as they discuss their cheesy ad concepts. Often funny, we do actually want to hear their horrible ideas. And at the end of each ad, the vintage version of the product is shown front and center. Usually, a current product commercial is shown after. I wondered, though, will the average person (besides marketing types) also be stopping the DVR during these commercials? I think the answer is “yes” from the success of these commercials, according to Unilever. The key to these ads is that anyone interested in entertaining commercials and Mad Men will want to watch. Does it mean viewers will buy more of Unilever’s products? Maybe. Will they remember the ad and product? Absolutely.